Kaladesh is the latest set for Magic: the Gathering, and the first set in the new Kaladesh block. 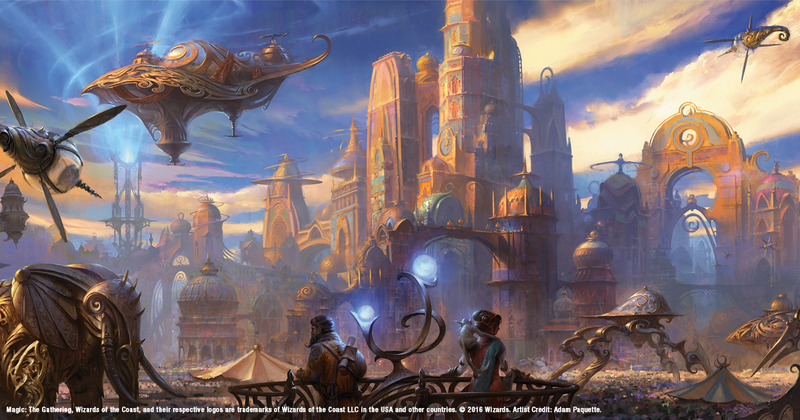 Kaladesh introduces the home plane of planeswalker Chandra Nalar. Kaladesh has been hinted at in previous sets, but this is the first set to fully explore this plane of artifacts, tinkerers, and artificers. Kaladesh has a strong artifact theme and introduces new mechanics in the form of energy counters and vehicles. It also establishes a special set of “Masterpieces” similar to Zendikar Expeditions. This extremely rare sub-set of cards consists of 30 artifacts–from classic cards that have become staples in Commander to all-new cards from Kaladesh. This is a sealed deck event where each player will receive a special kit containing six Kaladesh packs, a promo card, and a spindown life counter. Continuing in this set, ANY rare or mythic rare can appear as a date-stamped promo card! Each player builds a 40 card minimum deck from the cards in their kit and basic lands (bring your own or use ours). There will be 4 total swiss rounds (3 rounds for 2-Headed Giant) with prize payouts based on your overall record in the event. In addition, each player who wins a round will get a free draw from our special Promo Board of Mystery! The Board of Mystery will be seeded with lots of promos from previous releases, including some very special surprises!